Geez, it's 2002 and they're still not done building that darn space station from 2001 yet! '...the zero-g area at the center of the barrel.' It's all zero-g, unless you're hanging onto something. No, these are rotating stations. So there is artificial g at the rim, decreasing as you move towards the hub. Of course they are sending letters. How else would you communicate with good old Earth when everybody knows that interstellar phone calls are much too expensive. No, there is no 'artificial gravity' on a rotating habitat. If you are standing on / attached to the hab structure, there is a centrifugal force that can substitute for gravity, which is proportional to your distance from the rotational axis. But any object inside the hab that is not attached feels no 'gravity' and will follow a free-fall path until it contacts some part of the structure. "there is a centrifugal force that can substitute for gravity." As for the original post - do some research. Inter alia, the airmass inside will also take on a rotation, and thereby tend to impart a "downward" force on untethered objects floating in it. Rodger Cunningham: "Well, what is 'artificial gravity,' as opposed to real gravity, supposed to mean?" Real gravity is a distortion of space caused by the presence of a mass. "Gravity" in a rotating hab is centrifugal force. Wutzke: Good point about the air mass rotating, too, but I don't believe it would be enough to give the effect of a uniform artificial gravity field. 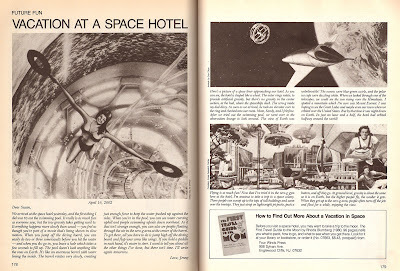 Did nobody notice that the illustration at the bottom right was part of http://www.paleofuture.com/2007/03/sport-in-space-colonies-1977.html, done by Rick Guidice in 1977? Recycled paleo-futurism always was the best! Not breathing too hard so as to minimize their carbon footprint while playing World of Warcraft 100+ hours a week and watching cable specials on what The Planet will be like after humans are all extinct. What a Shining Bright Future That Will Be!